Close-up of a horse jumping a hurdle. Well, for starts, it is a sport that has long been associated with royalty for many generations. In these modern times when cars and other mechanical inventions are the dominant forms of transport, has notably seen its popularity dwindle mostly because it is now regarded as an elite sport as a result of the high costs involved. There is a myriad of factors that make this sport an exclusive one, such as the cost of breeding horses, the risk involved (insurance cover ), and the high registration fees to participate in competitions. Another noteworthy factor is that it takes a lengthy period of time to train to become an equestrian. It is not simply about riding a horse, it is about completing the challenge where there are obstacles around a course, within the allotted time intervals. To manoeuver with such a swagger takes hours of practice over the course of many years. Showjumping has transitioned from being a sport exclusively for royal families into a sport for the elite. Nowadays, it costs hundreds of thousands of dollars to acquire high breed horses while their maintenance cost runs into the tens of thousands of dollars each month. Add the fact that registering for a competition and shipping the horse to the destination contributes to the bulging cost and you begin to have an insight that lets you take a scope inside the niche world of equestrian show jumping. It is no wonder that only the uber-rich participate in the annual events. Take for instance, in the U.S.A., according to the US Equestrian foundation, the top 30 show jumpers’ list consists of the daughters of at least 3 public figures with a net worth upwards of $345M. Eve Jobs, daughter of Apple founder and billionaire Steve Jobs (now deceased), Georgina Bloomberg daughter of former New York Mayor and billionaire businessman Micheal Bloomberg, and Jessica Springsteen daughter of one of the best selling artists of all time Bruce Springsteen. Jessica Springsteen has represented the U.S. in international events and won numerous awards. However, for others, it is simply a hobby and a very expensive one! 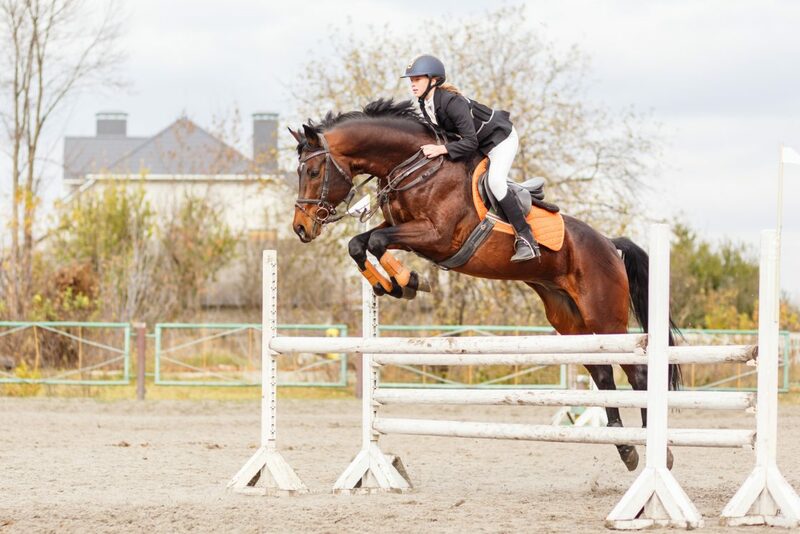 To participate in showjumping, there are various factors that actually contribute to one becoming an equestrian. A notable fact is the sport’s decorum which has been around for over a hundred years even before the 1912 Olympics where boots, jodhpurs (full-length trousers), a protective helmet, breeches (knee patches), and jackets are part of the official attire for all competitors. Regardless of the climate, the jacket is mandatory for both men and women. Specially crafted, when worn especially by ladies, with its formal and unique appearance, you could become known as the raincoated woman in social circles. The courses are different and are always lined with obstacles, railings, and water jumps. It is the mandate of the rider to control the horse’s stride to accurately jump over the railings and obstacles in a limited time period. By doing so, points are earned and tallied by the judges before a victor is declared or announced. It is necessary to avoid falling down by accurately estimating the angles of approach. Next:Is Endurance Riding Right for You?